This recipe is an adaptation of One Good Thing By Jillee's English Muffin Bread. As written, the recipe does not work with einkorn flour. While einkorn contains gluten like modern wheat, it is structurally far weaker than the gluten in high-bred modern wheat. While it will allow the bread to rise, it will then quickly collapse either during the rise, or when baking. It is therefore critical to not use too much yeast, and to not allow the dough to rise as high as it theoretically could (before collapsing). 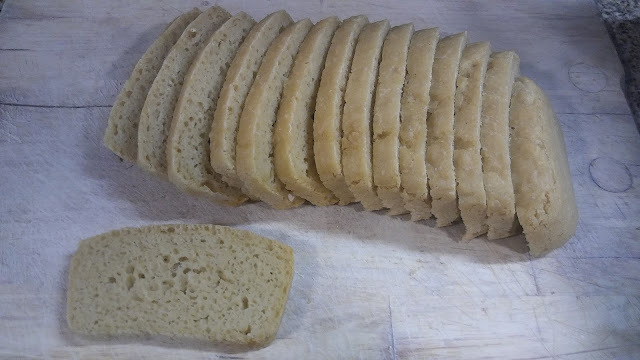 The good thing about this recipe is that the dough is very wet, more like thick batter, which is ideal for working with einkorn. 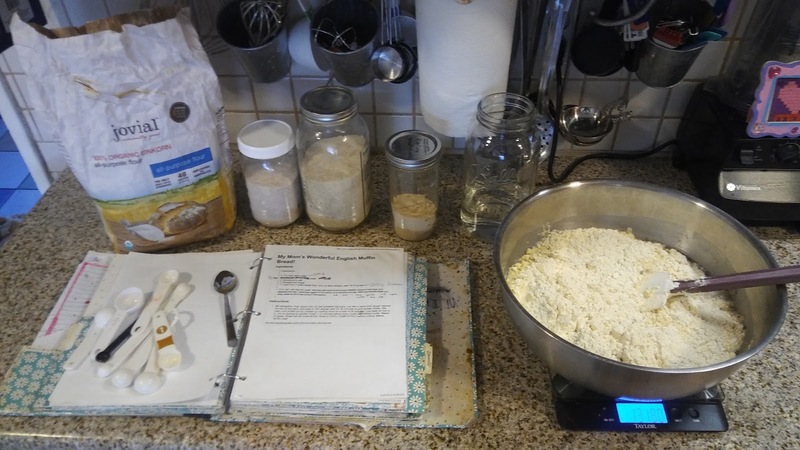 Weighing einkorn flour (as opposed to measuring it) will yield far better results, as it is much more accurate. Kitchen scales are inexpensive and save a lot of time, so if you don't have one I highly recommend getting one. 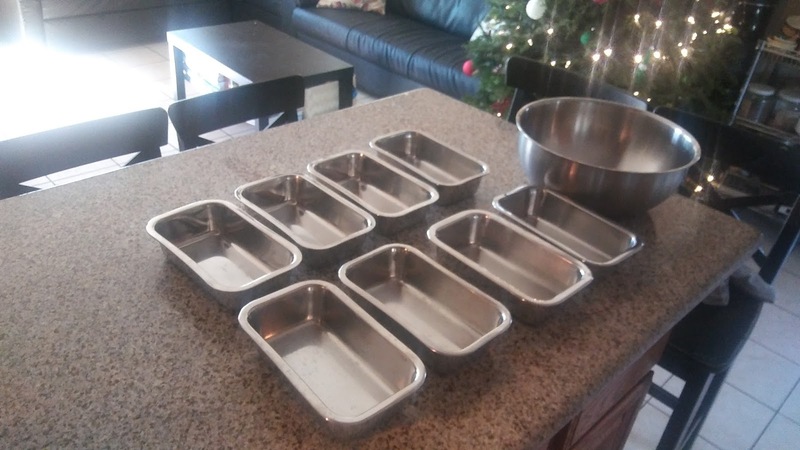 I use and love these loaf pans. I buy all my einkorn flour from Jovial Foods. I typically whip up one batch of the dough, then move the first four pans to the oven and start them rising while making up a second batch, and then bake 8 loaves at a time rather than just 4. 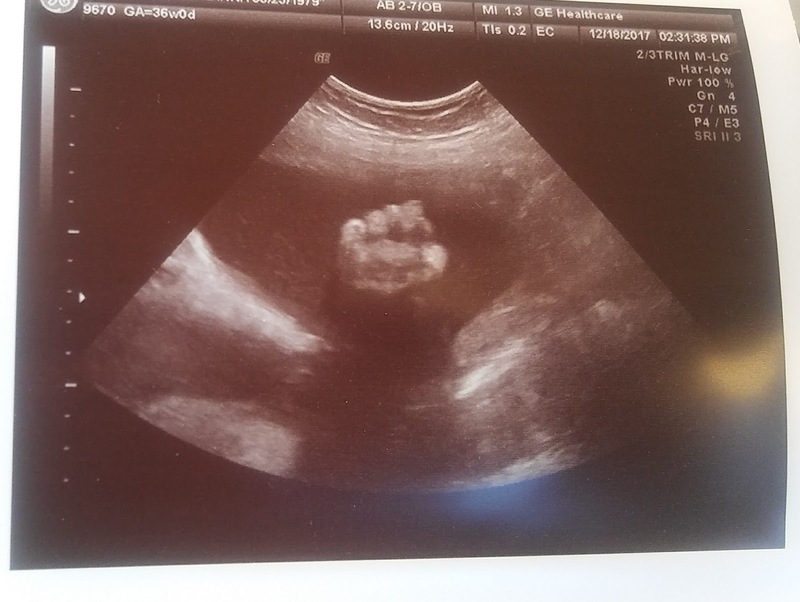 Last week, I had another ultrasound. At my 20-week anatomy scan, the baby was in such a position that the tech could not get all the heart images they were supposed to get. That, combined with the fact that this baby's heartbeat has been more challenging than average to track on Doppler, made my midwife recommend I go in for another ultrasound just to make sure all is well. All did turn out to be perfectly well, praise the Lord, and of course we had the added joy of watching this little one 'live on screen'. 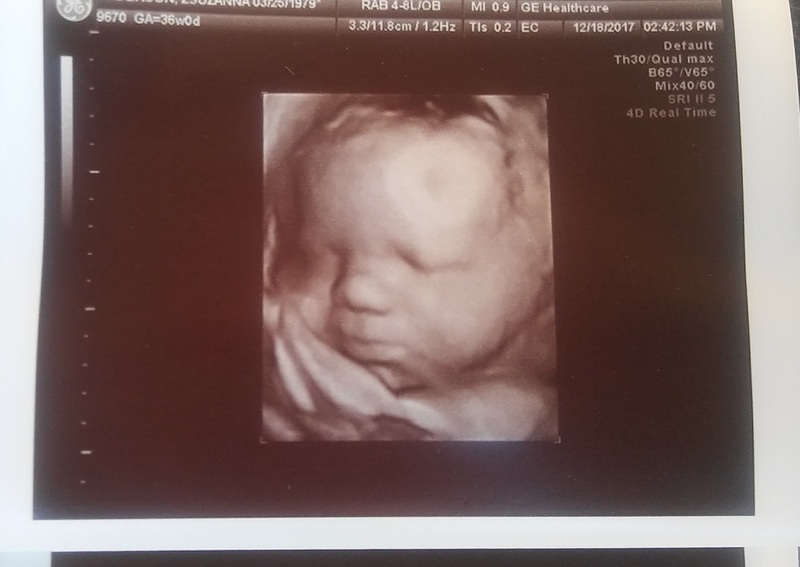 The 3-D ultrasounds are incredibly detailed now. Baby opened and closed his/her eyes, sucked on his/her hand, and looked just like our other babies. We again chose not to find out the gender, so I have no exciting announcements in that regard. Baby was measured at approximately 7 lbs 1 oz, which made me think they must be way off on the growth predictions, but the tech said they are usually within one ounce, give or take. I don't know if she's wrong or if this baby is indeed large for dates. The last two of our three babies were 6 lbs and change at birth, whereas this one might still gain as much as a half lb per week for the next four weeks! I was especially surprised by this estimate since I myself have only gained 15 lbs thus far with this pregnancy, having stayed on Weight Watchers the full nine months (in maintenance mode) to keep from gaining unnecessary pounds. Looks like I might be shedding most of that overnight when the baby is born! 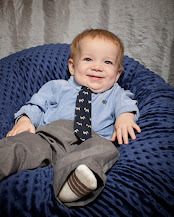 I will blog another time in more detail about WW and following the program while pregnant or breastfeeding. Speaking of food, I am almost completely done stocking the freezers for after the baby's birth. Between making room for the precooked breakfasts and dinners, and organizing a group beef buy from a local ranch, I went through all four of my freezers over the weekend, tossing odds and ends and taking inventory of everything, as well arranging it all for maximum efficiency. I do this every six months when I do a group beef buy, but this was the first time I actually made detailed inventory lists for each freezer, which I mounted in the kitchen so I can update them anytime we take out or add anything to any of the freezers. 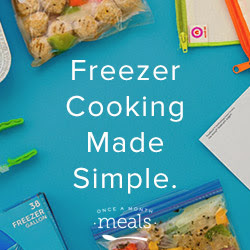 Our basic setup is that we have two fridge/freezer combos in the kitchen (called kitchen fridge and office fridge), as well as two deep freezers in the school room (called chest freezer and stand-up freezer). Here is the list of foods I have made for this time around. You can click on the images to see them in larger. The meals in red still need to be made and frozen, hopefully this week. I did manage to bake and freeze two gallon bags full of lactation cookies today, so that was an accomplishment and a load off my mind. I greatly depend on those in the early weeks to bring in my milk. This list is kept in Google Drive, that way I can update it anytime, anywhere, from my phone. It might seem my logistics and inventory sheets are a little overboard, but with a family my size, I need to outsource as much of my mental energy as I can. Very rarely do 10 seconds go by on any given day between the hours of 7 a.m. and 10 p.m. when someone (or multiple someones) do not come to me with various needs. It's like having 9 phone lines (10 if you count my husband, 11 with the new baby) that all ring, all day long, often at the same time, while I am the only one in the call center answering calls while also doing the day-to-day tasks that go into feeding, clothing, educating, and keeping alive and healthy all these people. If I can write it down and not have to remember off the top of my head, sign me up! My mother-in-law will once again fly out as soon as I go into labor to help watch the kids during the birth, and in the days after. My biggest dread is a) going through labor again (it does NOT get easier the more babies I have had! ), and b) giving birth in the winter. It's cold even in the daytime, but at night when I usually seem to be going into labor it's even colder, not to mention I labor in a birth pool and getting in and out will be misery in the cold. "Cold," of course, is a relative term. It's Arizona after all. Outside temps are between 50-75 in the daytime, and about 35-60 at night. In the house, we keep it an even 72 degrees. Still, that's cold for us, plus the days are shorter so it seems cold and dreary. You have been warned: total photo overload coming! Breakfast - Chloe was still asleep. We had eggs, bacon, and French toast made from croissants, something I learned on the Pastors' Wives retreat this summer. A game changer, I tell you! Costco sells really good ready croissants that are not full of junk that are perfect for making this. I spent the morning leisurely getting the big Thanksgiving dinner cooked, though I had prepped much of the food in the days ahead so there was not too much left to do. I used the slow cooker for the stuffing and the InstantPot for the mashed potatoes, which made things even faster and easier. The rest of the family enjoyed board games, decorating a gingerbread turkey (thank you, Trader Joe's - but dang, those candy-coated sunflower seeds are like crack! ), reading, going to the park, and making music. The game is called "Settlers of Catan". It's a favorite with the guys in this family. Isaac won. We had the typical Thanksgiving meal - brined turkey, stuffing, mashed potatoes, sweet potato rolls, and corn. Check out my gravy boat - that's a half gallon measuring cup! The one dish I didn't make this year was green bean casserole. I love it, and I knew my husband liked it, but nobody else cares for it. I figured nobody would miss it, so I skipped it. When I later asked him what his favorite part of the Thanksgiving meal was, he said it would have been the green bean casserole, but that there was none. Ha - lesson learned! Evidently, my husband really loves it! I won't be skipping it next year. Stephen looks excited for the meal! Check out little Chloe stuffing her face with food! It is unbelievable how much food that little girl can put away. Actually, she's not so little anymore, but a hefty toddler. After the big meal, most of us lay down for turkey-coma induced naps. Those who didn't played more board games. After very long naps, we had our typical dessert-for-dinner meal to round out the day. We do not have a set tradition of when we open Christmas gifts. Sometimes we do it on Christmas Eve after nap time, other years on Christmas Day in the morning. Some of it has to do with what day of the week those days fall on. Since this year Christmas Eve fell on a Sunday, we were busy with church all day. Our church hosts a Cookie Bake-Off on the Sunday afternoon closest to Christmas, so it was even busier than usual. We don't do stockings. I did not grow up with that tradition, and have never adopted it since we do advent calendars for each of the kids instead. So this year, we opened gifts on Christmas morning. I told the kids the earlier they got up, the later we'd open gifts, but they were still all up bright and early long before the sun - even Chloe who typically sleeps until 9 a.m. I changed my game plan to, "We'll open gifts as soon as I get a nice picture of all of you smiling." That looks like a lot of gifts, but there are a lot of us! :) As in the last few years, we tried to keep gifts mostly focused on events, outings, memories, and consumable goods rather than more toys. (We do make an exception for outdoor toys.) Having a family of almost 12 in a 1,550 sq foot home requires me to be a minimalist. Solomon and Isaac each got a gift card to a local roller-coaster park, and a new shirt/sweater each. John got a subscription to TinkerCrate*, and a retro handheld game console. 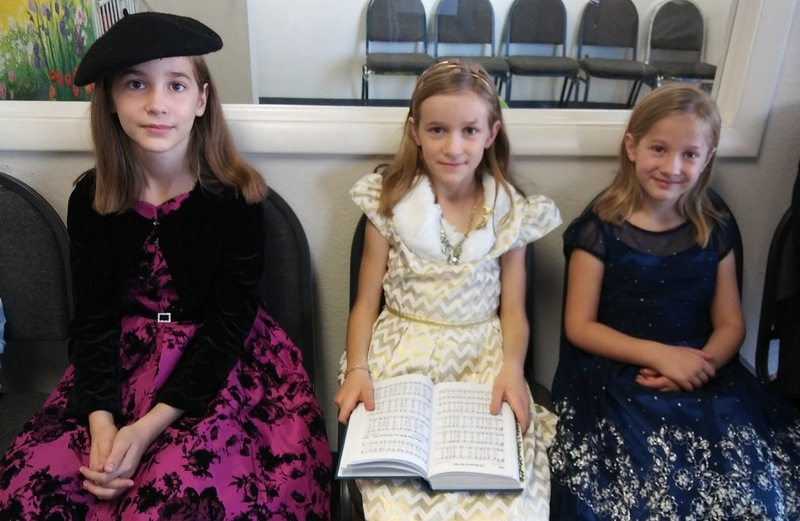 The big girls each got Christmas dresses (we did let them open those of the morning of Christmas Eve so they could wear them to church that day), as well as a kid's craft class at Jo-Ann's. Miriam also got a book and a single craft kit from DoodleCrate* (which she loved, so I will get her a subscription for her birthday in February), while Becca and Anna got matching outfits for themselves and their dolls as well as some books they had been wanting. Stephen got a Duplo pizza parlor, a knight costume, the latest Patch the Pirate adventure, and a sweater. Boaz got his first bike and a coloring book. 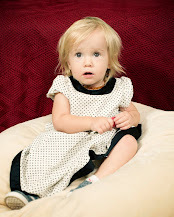 Chloe got a Christmas dress, as well as PJ's, and a CD with lullabies. The bulky thing under the blanket is Boaz's bike. There is a funny backstory to this gift. Back in November, my husband and I went on a 'date' to Wal-Mart. We brought 'Hurricane Boaz' along because he was up early from his nap and tends to wake the rest of the house once he's up. Once we got to the store I stayed behind in the van because I suddenly needed a cat nap myself, while Dad and Bo went into the store together. Shortly afterward, I received this photo from them. 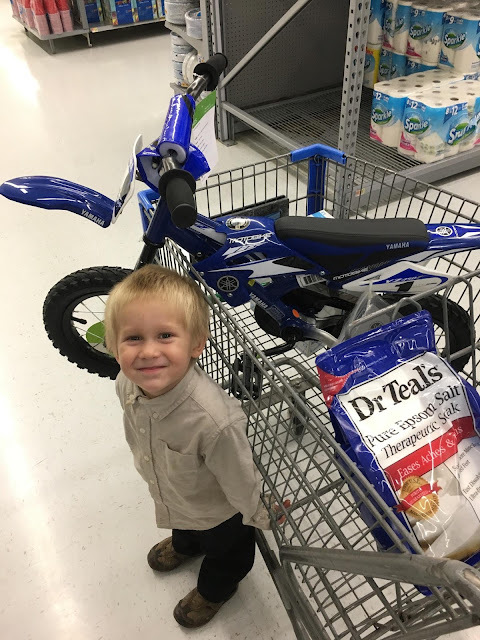 My husband, who grew up riding dirt bikes with his Dad, just could not resist this little bike for Boaz, who fell in love with it the moment he saw it. It took much convincing to get my husband to agree to at least hide it as a Christmas gift. Even though Bo already knew about it, I figured he would forget, plus he would be disappointed on Christmas if he didn't have a gift under the tree like the rest of the kids. Who COULD say "no" to that face??!? Then of course there were gifts from the siblings to the siblings. Again, to keep things simple, our tradition is that for Christmas, each sibling gives a gift to only one other sibling, keeping the grand total of gifts exchanged to 9 (as opposed to 72 if they exchanged gifts with every sibling - help us all!). There were also gifts from other relatives and friends. My gift for my husband, to keep in his office. I had asked him not to get me anything because he spoils me so much year-round that I could not think of a single thing I would have wanted much less needed, but he still surprised me with some thoughtful things he knows I enjoy. Being 37-weeks pregnant, I kept the meal a simple affair. I made a prime rib roast that came out sublime thanks entirely to grass-fed beef and Pioneer Woman's foolproof recipe. The side dishes were German fried potatoes, roasted broccoli, and popovers. Fast, easy, but oh so delicious! I love these cast iron muffin pans! 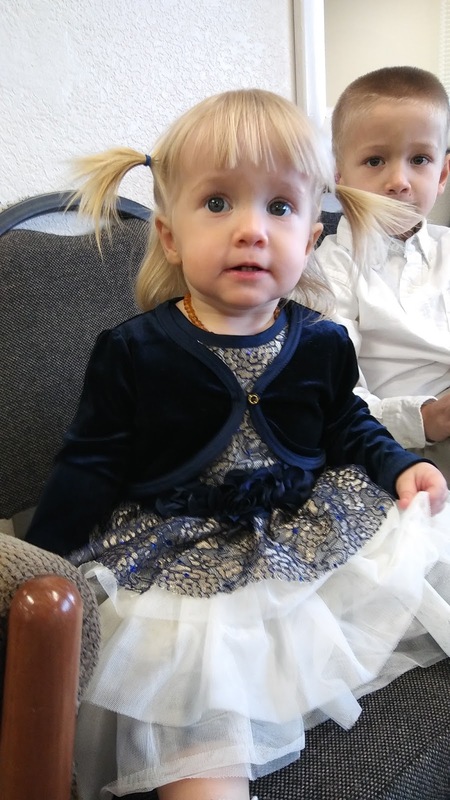 Unfortunately, shortly after we opened gifts, Isaac and Boaz started coming down with a sickness that had been making its way around our church and finally seems to have caught up to our family. Boaz went back and forth all day between running a fever and throwing up, and being perfectly fine, while Isaac was lying down sick most of the day and even missed the big Christmas dinner. Both are feeling better today and on the mend, but now Solomon and Anna are on the downward. Hopefully, this will work itself through the family quickly. I have been giving them these capsules and Reed's ginger ale (with real ginger) which seems to help them get well very quickly. I have blogged about both unschooling and positive-only parenting before. Radical unschooling is the unholy union of these two concepts. If you thought both ideas by themselves were dangerous and foolish, the fallout of parenting failure when they are combined is exponential. In a nutshell, "radical unschooling" means that parents do not enforce any rules for their kids, in ANY area of life, ever. You read that right. Kids do whatever they want, whenever they want. They have no set bed times, eat what they want when they want, are never forced or even coerced to obey their parents, have full 'body autonomy' including deciding if they want to shave their head at age 3 or if and when to take medicine, are not expected to do any school work, and are basically NEVER made to do anything they don't want to do. The parents' job is to cater to the child's every whim and thus enable them to turn into the wonderful humans they were destined to be. Except they don't. They grow into the wicked, entitled, lazy, spoiled young adults we see everywhere these days. The 'philosophy' behind this (un? )parenting is that children are born innately wise, intuitive, pure, and sinless, and that if given the freedom to make their own choices not influenced by corrupted adults who are already messed up from 'authoritarian parenting,' they will naturally choose what is best and wisest for them. The moms who fall for this nonsense then post on social media, wondering why their feral kids act like animals. They ask such deep questions as how to get their kids to stop playing video games and go to bed before the wee hours of the morning ("Don't worry, that's normal! "), how to stop their kids from eating only junk food ("Don't worry, that's normal! ), how to stop their kids from assaulting others ("Don't worry, that's normal! "), how to stop a tantrum ("Don't worry, it's normal!) - you name it, it's all normal, and something kids will grow out of over time. Until then, hugs, good vibes, and lots of good luck to you! "How would you all handle a 2 1/2 year old having a melt down in the middle of the night because you say no more breastfeeding so you can get some sleep? My toddler is getting worse with punching me very hard and spitting in my face. I try to push him away on the bed and he comes back fighting. I try to hold him and comfort him but he comes back fighting. He ends up crying to sleep. Am I just supposed to lay there and be punched/spit on? He doesn't listen to any words or reason. His raging wakes everyone since we all share a bed. I don't know what else to do." What else to do? What has she done??? Comfort him in response to being assaulted? One person recommended "keeping a hand towel nearby for the spitting." Another wondered why the mom would wean the child at such a young age - mom should just take a nap in the afternoon to make up for lost night sleep. If that same little tyrant were 160 lbs and 16-years old, he would kill his mother in a fit of rage. The only thing that is preventing him from doing so now is because he is lacking the physical strength, not the fact that he doesn't despise her THAT MUCH. My three (turning four in March) year old has started to self harm to express anger, in the form of biting or scratching herself. She uses this almost as a threat i.e. "I'm mad. I'm going to bite myself!" This style of parenting is nothing short of child abuse. Children without boundaries and consequences are the most miserable creatures. They grow up to loathe others and themselves, are loathed by others, and daydream about suicide. My 9 year old wants her nose pierced and I told her not until she's 13 or 14.. Is that a reasonable RU response? The overwhelming majority of responses were along the lines of "let her, and explore why you are so conflicted about her choice." On the subject of natural consequences, how to handle stealing. My 11 yo took $10 of mine, lied until I stared her down long enough that she reached into her pocket & gave it back. [...] She does these "types" of things often. General responses were: give her more allowance, figure out what she needs the money for, ask why she 'had' to steal it, and show her disappointment as the most effective punishment. I could go on with horror stories from these insane parents. When dealing with the unsaved, nothing should surprise us. They are spiritually blind. They are foolish, yes. They raise monsters we all have to live with, yes. But even so, I pity them. They will never know the joy that children that are raised in the ways of the Lord can bring. All their labor is in vain. The thing I find truly disturbing is when Christians fall for this nonsense. I am not just talking about "Christian Radical Unschooling," which yes, is a thing. I'm talking about mainstream, evangelical Christians who consider themselves 'conservatives' making the same kind of excuses about their little brats, which in due time turn out to be derelict young people and eventually worthless adults indistinguishable from their worldly peers. I am in another online group of Christian moms of large families that homeschool. Sounds pretty conservative, no? Sometimes, when I see the questions posted there and the responses, I have to double-check which group I'm in - the radical unschoolers or the Christian homeschool moms. This I have no pity for. "If therefore the light that is in thee be darkness, how great is that darkness!" Christian parents turning out one bad child after another with a similar 'success rate' as the world is a terrible testimony. It's just as bad a testimony as the fact that divorce rates among professing Christians are the same as that of unbelievers. It is an assault on the validity of Bible principles. Not like Germany is the bedrock of strict parenting these days or even was in my days, but being from East Germany and having had 'old-school' grandparents, I was raised in times and circumstances that were decades 'behind the times'. When we were newlyweds and young parents, I was often dumbfounded by permissive American parenting, where it is a virtue among many to let kids walk rough-shod over their parents and suffer it patiently. These same parents would never put up with that kind of treatment from their spouses. Toddler screams at you? Normal. Husband screams at you? Emotional abuse - call the cops. Imagine if he hit his wife and spat on her like these kids are allowed to do!! Who in their right mind would say, "This too shall pass, keep a towel nearby for the spitting and try to separate yourself to another room." It's madness and folly! I used to be told, "Just wait until you have a toddler!" When the first few of our kids made it past being toddlers with our sanity intact and our parenting still on track, it was, "Wait until you have a daughter!" So we had three in a row, all of which are sweet and kind and growing into godly young ladies. Then we heard, "Just wait until you have a teen!" Well, we have three now. They do suffer from some inevitable teen brain atrophy, but they are still godly, respectful kids who know their place in this family and are not malicious, just overgrown and sometimes clumsy pups on the cusp of productive adulthood. My kids are not perfect, but they are good kids who love the Lord and will grow up to walk in His ways. And as long as we parents have any say in the matter (which we do), they will reach adulthood without first bringing shame on themselves and us through being wicked in their young adult years. And yet, bad parents never want to take responsibility for their offspring turning out a failure, one after the other. They might blame the other parent, they might come up with some bogus condition their child suffers from like ODD (oppositional defiance disorder), Asperger (or what used to be known as lacking social graces), their preacher being too nice/mean, the Bible being too strict, modern society corrupting everyone, or any number of excuses. To them, raising children is like rolling the dice. Some keep getting lucky, and they keep drawing the short end of the stick - but the fault is most certainly not with them, oh no! You just wait! It reminds me of divorced people who think there are only two kinds of marriages: those that have already failed, and those that are on the way to failure. Until you die having never divorced, your marriage is in question in their mind, even two, three, four, five decades later. Misery truly loves company. Misery also hates those who succeed where they have failed. I'm here to tell you, this defeated, can't do attitude is not true. Let me be clear: my kids turning out right will have nothing, ZERO, to do with me being better than anyone else. It will be 100% by the grace of God, and applying HIS principles to child raising. If I can raise good kids, in spite of myself and my shortcomings, ANYONE can. Any idiot can follow Bible teaching, and have an end product that is far greater than the sum of its parts. To God be all the credit. All we have to do as parents is guide our kids in the fear and knowledge of the Lord. It's that simple. And: IT WORKS. Simple does not mean easy, though. It might not be easy if we love ourselves more than our child, and care more about staying in good graces with them today rather than having them thank us later. The Bible says there are two critical ingredients to raising kids: the nurture and admonition of the Lord. Or in more simple terms: love them, and don't let them walk all over you. Parents who raise derelicts love themselves, and are too lazy to put an end to bad behavior, thus going against both of these points. Kids do not turn out right overnight, and they are not lost overnight. They continue for many years on the path of right, lit by God's word, or they continue down the way of transgressors, unchecked for many years. There are a thousand parenting decisions made over the course of many years that keep kids on one path, or the other. When the 18-month old first throws herself on the floor in an angry response to being told "no", one quick swat is likely to end that behavior (and other ones like it) from ever manifesting again. Choose to distract and coddle the child instead, and soon you will have a screaming 3-year old on your hands that has made a horrible habit of pitching fits to get what they want. Breaking that bad habit is a lot harder at that point, so the parent is even less likely to do it than they were two years earlier. Continue to give in to the whining and tantrums, and you will soon have an entitled monster on your hands. The problem escalates more and more. By the time kids are in their teen years, the tracks are almost irreversibly set. The train is in motion and at full speed. The train wreck is inevitable. When it happens, the parents will sit back and claim it's not their fault, but either they are lying, or the Bible is not true. Ungodly children are the result of lazy, selfish parenting gone wrong from the start, and never corrected. 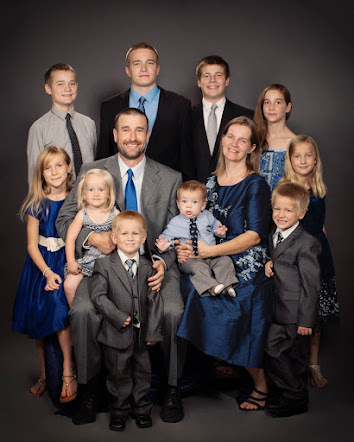 If it were a roll of the dice, "having faithful children" would not be a prerequisite for the pastor.